Fatigue is a failure mechanism that involves the cracking of materials and structural components due to cyclic (or fluctuating) stress. While applied stresses may be tensile, compressive or torsional, crack initiation and propagation are due to the tensile component. One of the intriguing factors about fatigue development is that fatigue cracks can be initiated and propagated at stresses well below the yield strength of the material of construction (these stresses are usually thought to be related to elastic deformation, not plastic deformation. Stage 1: Crack initiation — Fatigue cracks almost always initiate at a free surface and near a stress riser (e.g. the toe of a weld). The initial development of a fatigue crack occurs at localized discontinuities in the metal’s crystal structure. The generation and movement of discontinuities actually strengthens the metal through plastic deformation. This phenomenon is called work hardening. As the metal becomes work hardened, it loses its ability to plastically deform in the localized area where cyclic stresses are evident. Once the metal reaches its plastic deformation limit, the discontinuity become a small crack. Stage 2: Crack propagation — Once a crack is initiated, continued cyclical stresses repeat the process, slowly growing the micro-crack, which becomes a threat to structural integrity. Stage 3: Failure — The final failure event (i.e. catastrophic fracture) can be ductile or brittle, depending on the material, thickness, temperature and the applied stress. Fatigue failures typically occur suddenly. The fatigue-induced fracture surfaces of a broken component are typically smooth and show no evidence of plastic deformation. Where is a crack likely to develop? What is the remaining life of the component if a crack develops? Several processes may be used to extend the fatigue life of a metal component. These processes focus of enhancing the surface properties of a component. This includes case hardening using a carburizing or nitriding process or shot peening the surface in order to induce residual compressive stresses. Smoothing and/or polishing are also used to minimize stress risers. Fatigue properties can also be improved by increasing the thickness of the component. However, increased thickness can result in the final failure being brittle rather than ductile. a curve that does not show a fatigue limit as shown in Figure 2. Iron and titanium alloys typically display the former conditions while nonferrous alloys typically display the latter. 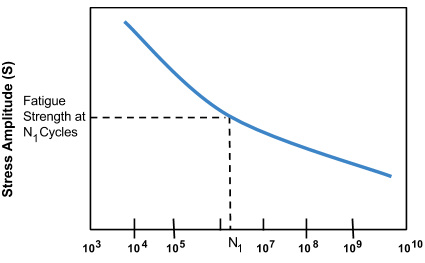 The fatigue limit is observed on the plot as a horizontal line, as shown in Figure 1, representing the largest value of stress that will not cause failure and becomes independent of the number of cycles. 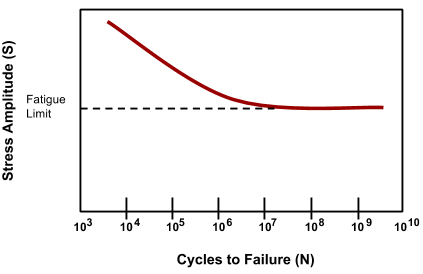 The relationship for the latter curve (Figure 2) shows the number of cycles a metal can endure before failure for a range of applied stress levels. In general, metals can sustain high loads for a low number of cycles (i.e. low-cycle fatigue), or they can sustain low loads for a large number of cycles (i.e. high-cycle fatigue) before failure. Fatigue failures occur in a number of forms; however, they can be generally classified in one of two categories: mechanical fatigue or thermal fatigue. Fatigue damage develops as a result exposure to of cyclic stresses for an extended period of time. It’s worthy to note that numerous classes of components (e.g. rotating equipment and pressure reduction valves) designed for alternating mechanical stresses are not usually subject to fatigue failure unless damaged by some other mechanism (e.g. foreign object impact damage or corrosion). The following types of fatigue can generally be classified as mechanical. Vibration fatigue is a type of mechanical fatigue caused by vibration of equipment or piping during operation. As an example, vibration fatigue could occur as a result of operating equipment beyond designated integrity operating windows. Vibration-induced fatigue damage is typically caused by poor design, lack of support (or dampeners), or excessive support or stiffness. The amplitude and frequency of vibration are critical factors for vibration fatigue damage that leads to crack initiation and crack propagation. Corrosion fatigue occurs from the simultaneous actions of chemical attack and mechanical fatigue. Corrosive environments are known for deteriorating metal. As corrosion develops, the area of damage serves as a point of stress concentration and results in the initiation of a crack. Thin films and coatings are applied to protect equipment from corrosion; however, mechanical fatigue will frequently damage these films and expose the equipment to the surrounding conditions. Thermal fatigue is simply a failure that is induced by cyclic temperature changes. This mechanism is most often encountered in the tube assemblies of fired heaters. Mechanical fatigue may or may not be present. In most services, thermal fatigue is caused by start-ups and shut-downs. Sudden temperature changes are referred to as thermal shock and result in immediate failure. Start-ups and shut-downs increase the susceptibility to thermal fatigue. Rapid heating and cooling rates also increase susceptibility. One rule-of-thumb indicates that thermal fatigue is likely to develop if the temperature swing between exceeds 200°F operating temperature and shut-down. Designs that minimize stress concentration sites, blend grinding of weld profiles and requiring that transitions in thickness be gradual and smooth. Use of controlled rates of heating and cooling rates during start-up and shut-down. Minimizing differential thermal expansion in dissimilar metal joints. Where possible, incorporate flexibility that will accommodate differential expansion. Callister Jr., William D., and Rethwisch, David G. Materials Science and Engineering. 9th ed., John Wiley & Sons, 2014. Ensuring the integrity of process piping systems in the Oil & Gas industry (specifically those related to the ASME Code B31.3) is a key issue with respect to the process, business, safety, and the environment. However, in the current cost reduction environment, some companies are adopting a very risky strategy for piping systems where maintenance and inspection tasks are reduced and eliminated indiscriminately, without considering the relative importance of piping for the process.